I read all sorts of comic books growing up, but The Incredible Hulk was my favorite. But the big green galoot’s run is coming to an end, and I’m not sorry to see him go. The Hulk has a dark side that’s haunted me since childhood. 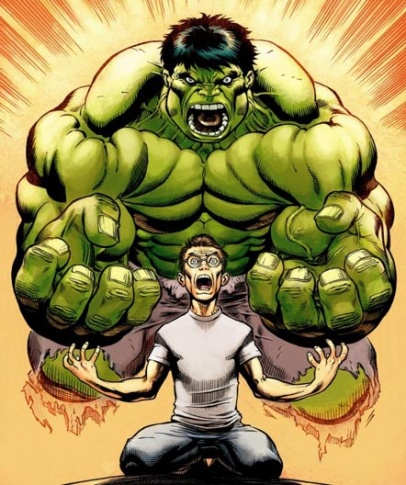 “The madder Hulk gets, the stronger Hulk gets!” Really? The comic book had a brilliant premise, creator Stan Lee’s combination of Frankenstein and Dr. Jekyll and Mr. Hyde. 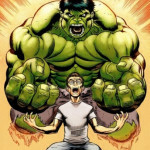 Meek scientist Bruce Banner harbors a monster inside him, a big green wrecking machine who comes out when Banner is angry or stressed. Push pansy Bruce far enough and he transforms into a Not-So-Jolly Green Giant. Hulk smash! Who among us wouldn’t like to have that transformative power on occasion? As a kid it represented a chance to right a thousand injustices, a chance to tip the scales against bullies, older kids, and adults. But it was all a lie. Losing your temper never makes you stronger. It makes you weaker. Lose your cool, and you lose your advantage. It took me a long time to learn this. I punched a lot of holes in walls, and busted innumerable telephones over the years. In 2003, I raged against an ATM machine, a stupid stunt that cost me hundreds of dollars in fines and almost landed me in jail. (Did you know there are cameras in those things? You did? Oh. My bad.) My temper has never worked to my advantage. Rob smash! But the only thing it ever got me was heartache, a reputation as a hothead and a jerk, and a hand injury. 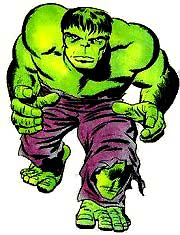 Original artist Jack Kirby made the Hulk menacing. I’ve finally managed to control my temper (well…I’ve improved…) I’ve mellowed with age, therapy, and medication. But it wasn’t until recently that I began to wonder how much growing up with The Incredible Hulk played into my violent outbursts. I can’t lay all the blame on the Jade Giant, but I don’t think following his temper-fueled adventures did me much good as a kid. Unlike many superheroes, Hulk wasn’t a very good a role model. Stan Lee created many memorable superheroes, characters that were very human despite their special abilities. Daredevil was blind. Spiderman was a high school geek. The X-Men were all misfits – mutants– looking for a way to fit into society. These Marvel heroes taught young readers respect, hard work, and other basic building blocks of self-confidence. But Hulk wasn’t Hulk unless he lost his temper. Some superheroes use their powers to enhance the lives of their alter egos. Peter Parker and Clark Kent always had great scoops for the newspapers they worked for. Daredevil would capture bad guys, and his alter ego, criminal attorney Matt Murdock, made sure they stayed in jail. But Bruce Banner’s superpower actually ruined his career as a brilliant scientist. 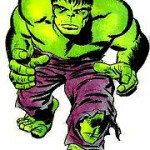 Most storylines involved a few pages of Hulk smashing things up then leaving poor Bruce Banner to either pick up the pieces or run from authorities. Banner lived the life of a loner, a fugitive, no friends, no family, always on the run. That’s what a bad temper will get you.